"What’s really notable about this and why it’s so important for Relativity and the industry is that this is the first time that Telesat, or any major global satellite operator, has selected a completely venture-based aerospace startup for launch services," Ellis said, noting that the companies had been in extensive discussions prior to announcing this contract. "The credibility of aligning with Telesat we believe is huge for what Relativity is developing." Relativity is developing the Terran 1, designed to place up to 1,250 kilograms into low Earth orbit for $10 million per launch. The company is making extensive use of additive manufacturing technologies to be able to produce the rocket inexpensively and quickly. That use of advanced technology attracted Telesat. "Early in our LEO program we decided that, in addition to working with outstanding leaders in satellite manufacturing and launch services who we know well, Telesat should also include NewSpace companies whose technologies and manufacturing methods offer lower costs and greater flexibility for deploying our constellation," said Dave Wendling, chief technical officer of Telesat, in a statement. Telesat announced in January a contract with Blue Origin for multiple launches of that company’s New Glenn vehicle under development. New Glenn is at the other end of the launch vehicle spectrum from Terran 1, with the ability to place 45 metric tons into low Earth orbit. That suggests Telesat plans to rely on New Glenn, and potentially other large launch vehicles, for deploying the bulk of its proposed constellation, with Terran 1 used to fill gaps in the system. Ellis noted that Relativity offers other benefits to Telesat. “We provide unique capabilities with the really fast manufacturing and response time,” he said. Once in operation, Relativity says it will be able to manufacture a vehicle “from raw material to launch-ready” within 60 days. Telesat is planning an initial constellation of more than 100 satellites, growing ultimately to 292 spacecraft. The company expects to select a manufacturer later this year, either Airbus Defence and Space or a consortium of Maxar Technologies and Thales Alenia Space. Ellis said Relativity is seeing growing interest from a number of other satellite constellation companies. The vehicle can also support medium Earth orbit missions and even some small geostationary orbit satellites. There’s additional demand, he said, from various U.S. government agencies. Development of the Terran 1 remains on schedule for a first orbital launch “at the very end of 2020,” he said. The company is getting close the final flight version of the rocket’s Aeon engine while performing other work on the vehicle ranging from structural testing to avionics development. 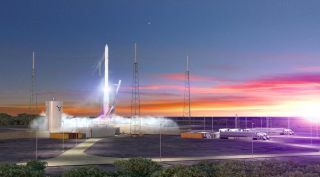 The company, which announced in January an initial agreement with the U.S. Air Force to develop a launch facility at Launch Complex 16 at Cape Canaveral Air Force Station in Florida, is working through the environmental review process and building permits for that facility. Ellis added that Relativity is in “pretty close to final stages” of identifying a West Coast launch site that would allow Terran 1 to launch missions to polar orbits.